Thanks to a number of factors, including advancements in solar technology, dropping costs of solar, and increased consumer demand for clean energy sources, solar power is booming in the United States. In fact, the US now has over 200 times as much solar photovoltaic (PV) capacity installed and operating as it did in 2002, and the solar power industry shows no signs of slowing down. A recent report from Environment Massachusetts Research & Policy Center, called Shining Cities, At the Forefront of America’s Solar Energy Revolution, highlights the growth of some of the most successful solar cities in the US, and has some surprising comparisons of solar power in areas that aren’t normally thought of as solar hotspots. One poignant fact is that the top 20 solar cities in the US account for 7% of all US solar PV capacity, but represent just a small fraction of a percent of the land area in the country, which means that not only is solar a viable means for clean energy production, but that it’s also remarkably space efficient. Those 20 solar cities produce more solar power than was installed in the entire country just six years ago. If that type of growth is possible, even in what’s considered to be a stagnant economy, then the future of solar energy in American is indeed bright. Some of those cities were probably the ones you expect to see on a list like this, such as LA and San Diego California, and Phoenix Arizona, but others are somewhat surprising, such as Indianapolis, Indiana, coming in at number 7, Portland, Oregon, ranking at number 15, and Boston, Massachusetts, coming in at number 20. 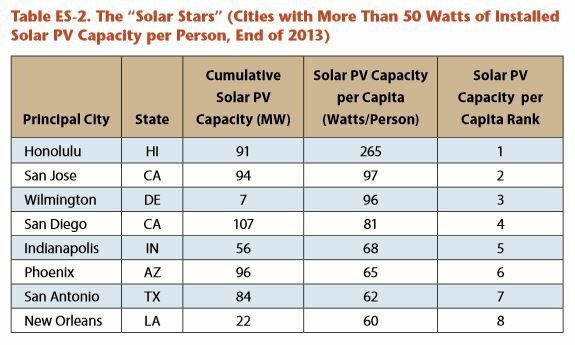 Another telling fact from this report is a ranking of the top ‘solar stars’, or the cities with more than 50W of installed solar PV capacity per person, which is a significant change from the first list, due to the per capita comparison. 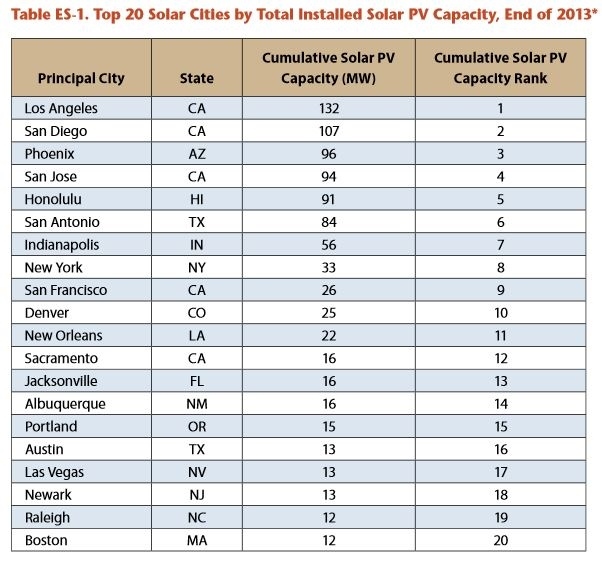 Another interesting thing about the cities named in the report is that they all use solar energy in slightly different ways, not just utility-scale solar or community solar projects, which points to the diversity of renewable energy deployments that are possible. 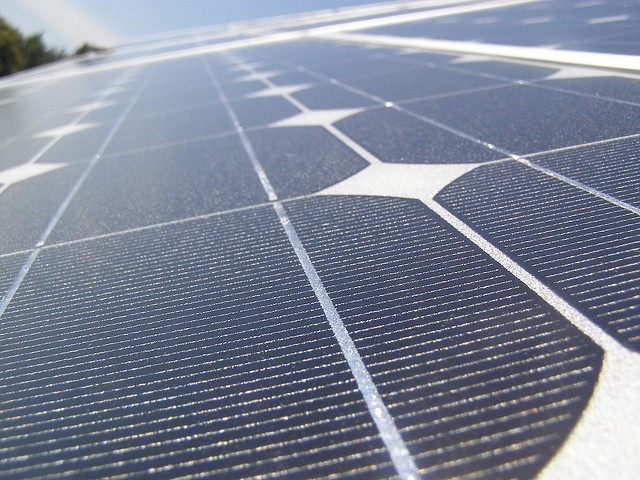 All of these leading solar cities, however, have some things in common, including commitments from local governments on solar power, support from city policies and energy programs, strong partnerships with the local utilities, effective state policies (including solar incentives and net metering policies) that are beneficial to solar producers, and support from federal programs, such as the federal renewable energy tax credit. 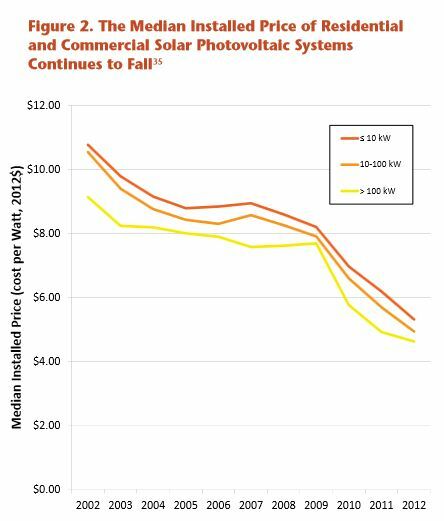 The dropping cost of installing solar, as seen below, is a big driver in both actual savings and perceived savings, and could continue to drop to the point where installing a residential rooftop solar system is a complete no-brainer, and maybe even designed into new home construction. If you’d like to read an in-depth comparative analysis of the growth of solar energy in some of the major cities in the US, as well as case studies about how cities have embraced and enabled solar power, download your copy of the report at: Shining Cities, At the Forefront of America’s Solar Energy Revolution.